Worried . . . Action Needed for our Wild Horses Now! As of today there has been no decision as to whether to hold a wild horse capture season. Licenses to horse trappers could be available anytime now by order of our Environment Minister, Diana McQueen. WHOAS has a foreboding feeling that this will happen. We need your help now. Write a letter to Minister McQueen and to Premier Allison Redford, telling them that despite a couple of meetings with other stakeholders, there is still no scientific evidence that our free-roaming wild horses are negatively impacting the ecosystem of our eastern slopes. Through your letter writing and email efforts to the government officials, you can help make a change. There was no capture season last year. Let them know you and your family and friends insist there is not another one this winter. Here is a sample letter you can use. Print or copy it, sign and mail it. (It’s also in a .pdf format). As an Albertan and Canadian, I am distraught to learn that you could issue horse capture permits with the intent of removing several hundred head of our wild, free-roaming horses this coming winter. I find this appalling. These beautiful animals have lived in small family herds for generations. They have been an integral part of Alberta’s heritage, its history and culture. I believe they deserve to live and be part of the whole ecosystem as it exists today in our Alberta foothills. I understand that your department undertook a count of the horses last March and that 853 were reported in the vast area of the foothills from Kananaskis up to Hinton. I have also heard that the ESRD could issue up to 300 permits for the 2013-2014 season which would eradicate up to 30% of the wild horse population. Despite stakeholder meetings this fall, there seems to be no interest on your part to undertake any scientific research to determine how these wild horses fit into the whole ecosystem or determine what numbers could be sustained in this vast area. Why has this not been done? Another way to help out. Free Spirit Sanctuary (https://www.facebook.com/FreeSpiritSanctuary) where you can order postage paid postcards to send to Minister McQueen. You can email requests to freespiritsanctuary@gmail.com. There are 2 designed specifically for youth to sign and one for the general public. 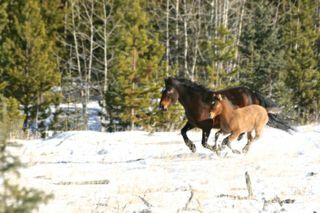 Help spread the news to family and friends that our Alberta wild horses need our help. Sent emails with the link to this page to many people I know in Western Canada. They in turn have sent the link to other people they know. Hopefully this will help out a bit. Got a letter going, sending it soon. Awful what has happened to the wild horses. I look at what they have done in South Dakota and just know it can be done here. We love horses and value the preservation of wild species. There are so many concerns popping up around our communities it is so good to see that there are people who care. My family and I would like to do more, dont know what that could be yet but there is just that pulling, when something is just the right thing to do. In voicing my outrage today I notice that the Minister of Alberta Sustainable Resources is Robin Campbell. Diane McQueen is now minister of energy. Just thought you guys would like to know that when addresesing your letters. I have sent mine to Robin Campbell. I am appalled by all of these excuses that the Government of Alberta are giving regarding culling the herds in Alberta! It’s the same all over Canada and the USA. The excuses are paltry,the reasons ridiculous. The horses mean so much to so many people! I am angered at all of the reasons and horrendous ways you entrap these beautiful creatures. I am begging you to reconsider, you will feel better and I am certain that the good people of Alberta will think better of a more positive attitude towards these actions!